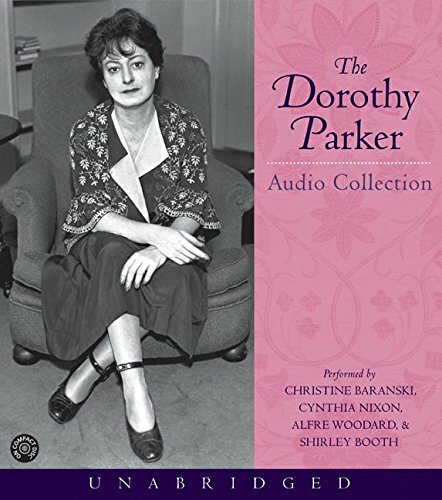 The definitive biography of Dorothy Parker is this one by Marion Meade. Dorothy Parker, What Fresh Hell is This? was published in 1987 and was re-issued in 2007 with a new author’s afterword that fills in what has happened to Parker’s legacy in the last 20 years. Meade is a thorough and detailed biographer who has a writing style that is perfect for a biography. She paints a balanced portrait of the amazing Dorothy Parker, and shows why Parker is an important figure in literature. Lots of documentation and sources cited; ancedotes, yarns, and myths about Mrs. Parker. Meade is the only one to interview Parker’s family. Of the three Parker biographies out there, this is the best one. Meade is like a private investigator who turns up new information and new facts about Mrs. Parker. You can’t be a Parker fan and not own this. Read an interview with Marion Meade here. Complete with full text, original recordings, and pictures of the artists, this offering is a multimedia delight. Three of the world’s cleverest poets. Three voices, each giving a rare glimpse of genius on the hoof. Did you know that Ogden Nash had an upper-class drawl? Who would have guessed that Dorothy Parker, wicked and irreverent, might have passed on the phone as the headmistress of an exclusive girl’s school? Three brief but pithy biographies are bound in a booklet with pictures of the artists and facsimiles of their signatures. A companion book contains the text of the poems. 5 CDs, 6 hours. Unabridged. Members of the Algonquin Round Table are here, as well as James Thurber, E.B. White, Ogden Nash, Groucho Marx, and S.J. Perelman. On the contemporary side, we have Garrison Keillor and Steve Martin, among others. There are a few classics, such as Thurber’s archetypal “Secret Life of Walter Mitty” and Woody Allen’s “The Kugelmass Episode,” in which a horny NYU prof magically slips between the sheets with Emma Bovary. Six fine pros divide the reading chores; their interpretations range from just above par to terrific. An essential album for anyone interested in the development of American humor in the 1900s. Was 2002 Winner of AudioFile Earphones Award.